When I first saw the posts of Anastasia Beverly Hills' new palette, Subculture, I knew I had to order it. It looked like the perfect palette for autumn, and was something really different to what was already out there at the moment. We've seen plenty of red, orange, and bronze toned palettes recently, so Subculture's greens, blues, and yellows really stood out. 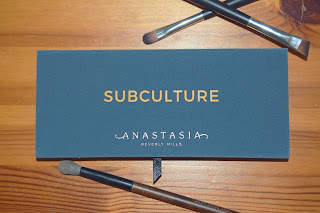 I ordered Subculture and Modern Renaissance (expect reviews shortly!) when the new palette launched on the 25th of July, and my order arrived a week later on the 1st of August. I would have loved it if delivery was between 3-5 days as opposed to 7, but I got it in the end and there was no damage so I can't complain. The packaging is lovely. It comes in a simple dark teal box and the palette itself has a nice velvet in the same colour. The name of the palette and the brand are embossed into it. Inside is a large mirror, and it comes with a brush. The blending end of the brush does actually feel horrible; sort of cheap and like nylon. However the application end feels perfectly dense and soft. 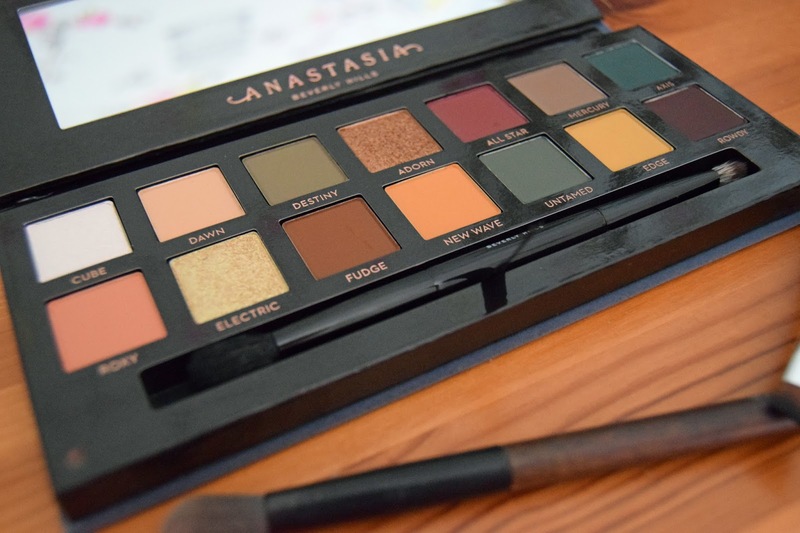 I'm not too fussed about this, as I typically don't use the brushes that come in palettes, but I would have liked a higher quality feeling brush, and if you like to use the brushes in palettes you may be disappointed with the blending brush on this one. 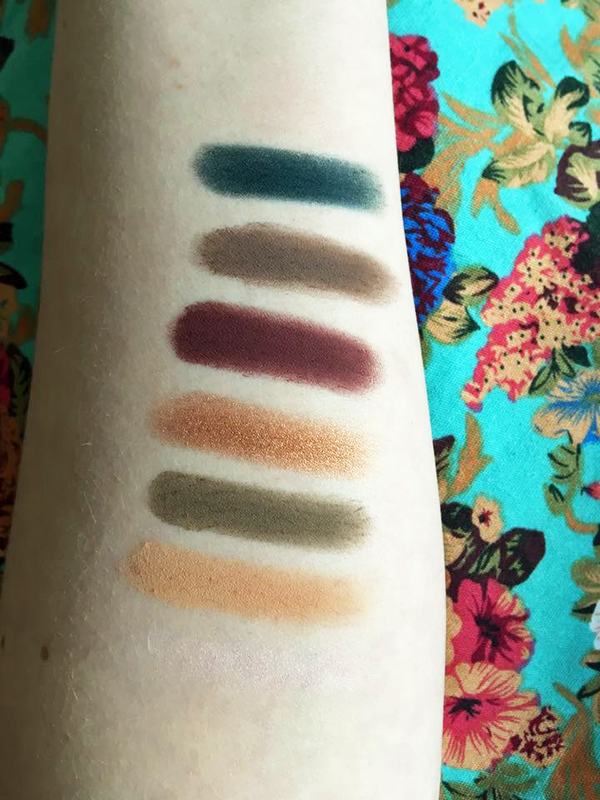 Before I swatched these shades, I was a bit nervous, having seen some bad reviews. A few people had reported that the shadows were powdery, so much so that one girl hit pan the first time she used the shade Roxy. 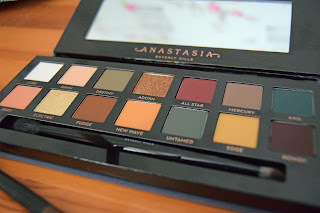 I was worried I had wasted my money, but having tried out the shades, I feel confident in saying that the people who experienced their shadows being as powdery as that had a bad palette, and I'm sure if that happens to you you can contact ABH about it. 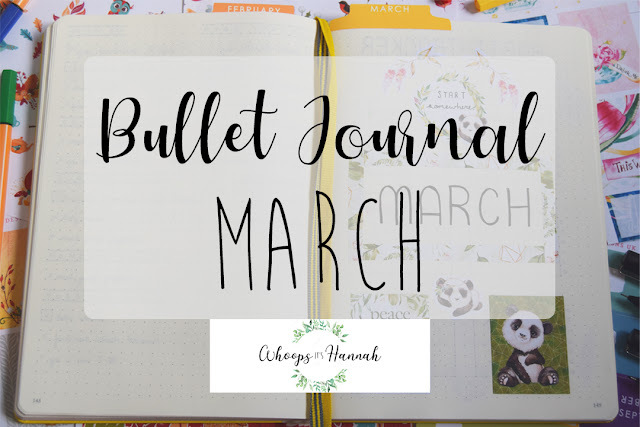 If you're put off this palette just because of those scary reports, don't be! On the whole, I found the shades to be incredibly pigmented, and they felt very smooth and soft to swatch. 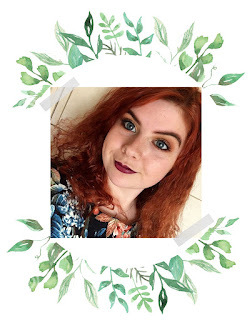 Some of the shades did have a heck of a lot of kick up and fall out though, so I would recommend reading through my thoughts on the independent shades and considering doing eyeshadow before foundation if you're planning on using them. Pretty much all of the shades were even and not patchy, but a couple were. I'm sure with a bit of effort and a brush they'd be easier to use. Cube - Cube looks white in the pan, but when I swatched it it was more of an irridescent pink/purple. It really captured the light beautifully, and was very shimmery, but I suspect it won't show up well on camera. Dawn - Dawn was a fawn beige colour. It's matte, and would make the perfect transition shade. It's very pigmented, and feels very soft and smooth. Destiny - this is a khaki green shade. Honestly I'm not terribly keen on this colour; it's just not my typical shade. However, it's pigmented and swatched smoothly, so I'm sure that I will be able to use it. Adorn - this is a beautiful coppery-bronze shade. It's beautifully shimmery, extremely pigmented, and applied smoothly; there was no chunky glitter in sight! All Star - This is a matte maroon/burgundy shade. It's a beautiful colour, but I did find it almost too soft - don't use loads on your brush as there was a lot of kick up and fallout. Mercury - This cool-toned taupe shade is another good transition shade. It's pigmented, and felt very smooth, however again it was a bit powdery with a fair amount of fallout. Axis - I love that this is the exact shade of the packaging. If you love the colour of the packaging, you will really enjoy this shade. I thought it felt a bit more powdery than the other shades I swatched so far, but there wasn't too much fallout. Roxy - I adore this shade. It's a peachy orange matte, and swatched beautifully. It was pigmented, smooth, and I didn't experience any fallout whatsoever. Electric - This shade in the pan made me nervous; it looks sort of like a lime green that I could never see myself using. However, swatched, it's more of a pale yellow gold, which is much more like something I could use! I love the shimmer in this, and I didn't have any issue with fallout on this shade. Fudge - This deep matte brown shade is perfect for in the crease. It's soft and smooth, and I didn't get any kickback or fallout, as I did with a few of the other dark shades in this palette. New Wave - Yas, a deep mustard yellow eyeshadow. How perfect is this for autumn? Mustard yellow is one of my favourite colours, so this shade excites me a lot. There was no fallout whatsoever, and it was extremely pigmented. I wasn't too sure if it would be seeing as it's yellow, but I'm pleasantly surprised that it was! Untamed - In the pan, this shade looks fairly similar to Axis, but when it's swatched I could tell it's a lighter, more green toned blue. I didn't think this swatched as nicely as some of the other shades; it seemed a bit more difficult to get an even colour. Edge - A true mustard yellow shade, this one swatched beautifully. It was pigmented, smooth, and covered every single bit of skin I swiped it over; it wasn't uneven or patchy in the slightest. Rowdy - This is a very very dark purple shade. I did find it to be a bit patchy, but I'm sure I could get more even coverage using a brush. There was a bit of fallout, but not as much as the other dark shades in this palette. Overall, I'm incredibly happy with this palette. I think the shades are beautiful, and will be perfect for Autumn. If you aren't afraid of bright, bold eye looks, then this would be worth buying. However, if you prefer a more natural or subtle look, there are only a few shades that could work for you so I'd give this a miss. 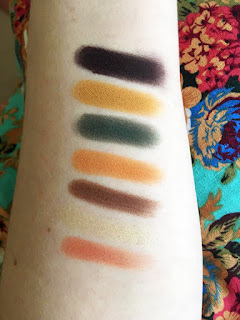 That said, the shadows are extremely high quality, and I look forward to getting lots of use out of my Subculture palette! 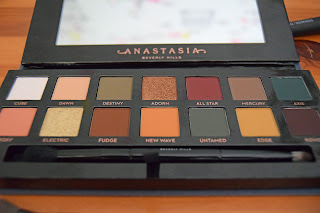 What are your thoughts on the Subculture palette? Are you a fan, or not?